Ali Keeler was born in London in 1973 and started learning the violin at the age of seven. During his youth, he played in several orchestras. In 1991, he went on to study classical violin at the Royal Northern College of Music in Manchester, where he gained experience playing in a string quartet. He moved to Damascus in Syria in 1998. During his time in Syria, he learnt to sing within the tradition of the maqam in the zawiyas of Damascus and Aleppo, receiving instruction in singing from the well-known munshid Ustadh Mustapha Karim. 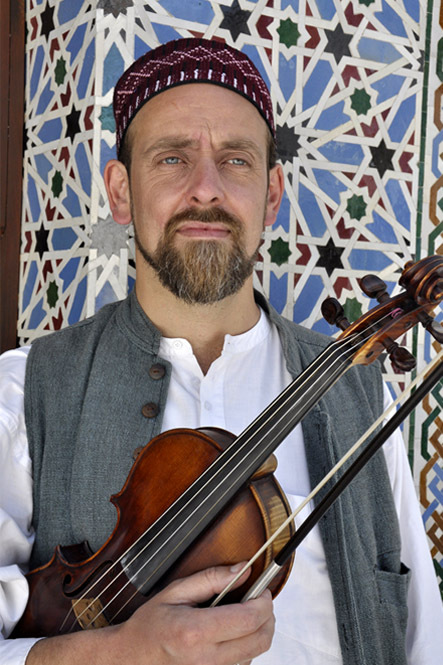 Applying his musical experience within the Arabic tradition to the violin, he has developed a varied repertoire of Celtic, Arabic, Andalusi and Turkish pieces. In 2006, he moved to Granada and in 2007 helped form the group Al Kauthar. He contributed within the group as the lead singer, violinist, arranger and composer, performing in concerts and festivals in Europe, Turkey and Morocco. In 2012 he founded the group Al Firdaus Ensemble, with whom he has performed in numerous concerts throughout Europe, the US, North Africa, Turkey and Lebanon. His recordings include: Violin solos in two of the albums of the British band Archive, Londinium (1996), and Take my Head (1999), both released with Island Records. The album Ruh, with the group Al Kauthar, released in 2008, in which he contributed as violinist, leading vocalist, composer and arranger. The album Safa, with Al Firdaus Ensemble, released in 2014, in which he contributed as violinist, singer, composer, arranger and co-producer. The album Nur, with Al Firdaus Ensemble, released in 2017 in which he contributed as violinist, singer, composer, arranger and co-producer. Sufi Songs of Andalusia released in 2017 with Mishkat Media.